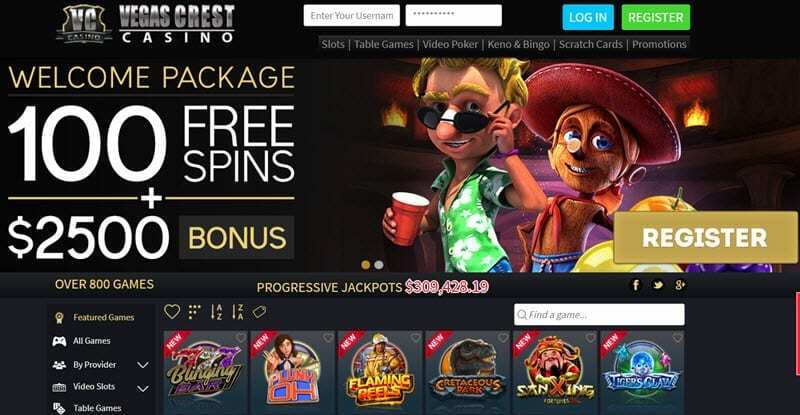 Vegas Crest Casino no Deposit Bonus - Get 20 Free Spins NOW! Licensed through the government of Curacao, Vegas Crest Casino is operated by Vista Gaming, a leading name in the online gaming industry with over 22 years’ experience of providing players with the best possible gaming experience. The website is powered by several software entities, including ,12 gaming providers and 9 are exclusive for US players: Rival, BetSoft, Mobilots, Endorphina, VistaGaming,Concept Gaming, Hitreels, Saucify and Xplosive Slots and 3 non-US ones : Booming Games, GameArt and Habanero. All new players have access to a generous welcome bonus, while regulars can take advantage of multiple offers of daily bonuses, loyalty programs, and VIP rewards. Play at Vegas Crest casino Now ! 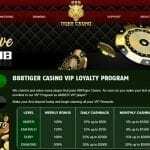 Vegas Crest Casino is home to an incredible “Welcome Bonus Package” offering up to $2500 in a casino bonus when you sign up. This welcome package includes 100 lucky free spins. 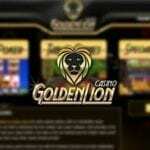 Players have more than 700 games to choose from at this online casino. Begin with the Tipsy Tourist Video slot for 10 free spins and receive a match bonus on each of two deposits. Players get a bonus of 200% up to $1000 on their initial deposit along with 30 free spins (Pinocchio game). As you can tell, that amounts to double your money. Players also get a bonus of 300% up to $1500 on their second deposit along with 60 free spins on the FruitZen 3D slot game. Wow, triple your money to play and 60 free spins to enjoy. Share the fun and get a reward when the friends you invite actually join and make a deposit. Your referrals get to enjoy the welcome bonus, more than 800 games on Desktop and 600 games on Mobile devices, and monthly promotions, while you get a reward of $25. Each month, Vegas Crest Casino gives away money to its loyal players. For every $500 you wager, you receive $1 back. Best of all – no requirements exist on how much you can withdraw or when you can do so. Once you earn VIP status, you gain access to a few perks that make playing at the Vegas Crest Casino even more rewarding. If you qualify, you can receive double rewards on your game play in addition to double comp points. Offering the standard grid display, Vegas Crest features lots of games for its players. You might want to spend a few minutes looking over the screen before jumping right in. While slots take up most of the room, there’s plenty of excitement offered by the casino’s selection of table games, specialty games, scratch cards, and video poker. Progressive jackpots add to the excitement as you explore 3-reels, 5-reels, and 3D versions of slots. Plus, Vegas Crest Casino is home to a number of interactive slots, ramping up the fun just a little bit. Games are presented in instant-play mode as the casino does not offer downloadable software for game play. Nonetheless, the graphics are crisp and colorful, and gaming sounds are realistic. Popular games include European blackjack, Atlantic City blackjack, Ride ‘Em poker, Texas Hold “Em, Money Magic, Major Moolah, Candy Keno, and Legends of Avalon. Scratch card players seem to favor Penguin Payday. Security: SSL data encryption delivers secure transactions, keeping your information safe and out of the hands of identity thieves. Multiple methods are accepted for deposits and withdrawals, offering flexibility and convenience for players. Deposits can be made using Neteller, Skrill, Ukash, Moneybookers, credit card, bitcoin, and bank transfers. Withdrawals can be made using bank transfers, Neteller, Skrill, courier check, check, and bitcoin. Questions? Customer support is ready to help any hour of the day using live chat, email ([email protected]), and fax. Fast responses and excellent service.